How to develop a visual identity that encompasses, under the same brand umbrella, the eclectic products that this furniture restoration workshop produces, while feeling contemporary and keeping true to the client's personality. Reviver is a Canadian collective of craftsmen, interior and industrial designers. Their work focuses on the restoration of furniture and home accessories, both by recovering their original aesthetic and giving them a contemporary and trendy character. The workshop uses classic restoration techniques and first-class materials that do not compromise the integrity of the treated furniture. Lacquer paste, varnishes, paints are manually applied and upholstery and carpentry work is handcrafted in all restoration processes. Reviver does not believe in "make-up" techniques that conceal the damages and that over time can cause a deterioration of difficult solution, but in lasting processes and a high attention to detail and finishings. The client wanted to find a way to make all of their upcycled pieces feel part of the same brand and make particular emphasis on their characteristic house style, being able to launch collections as a furniture design brand would. 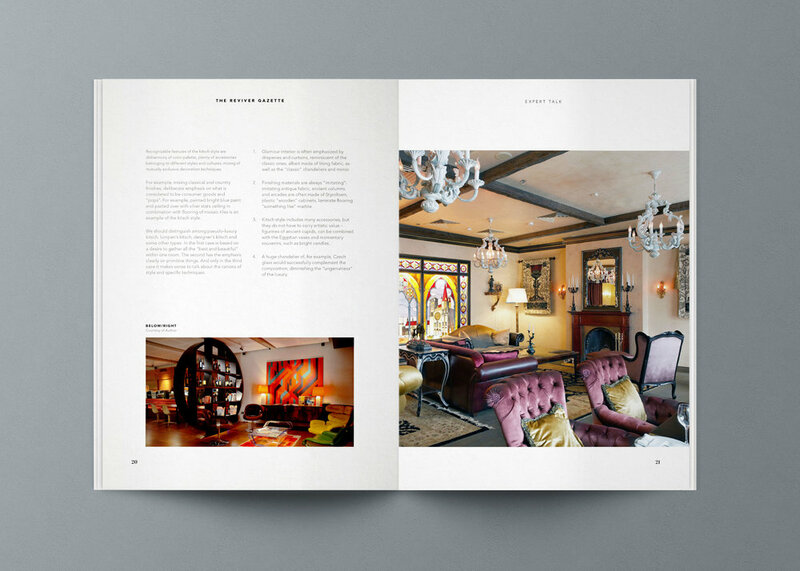 However, since their products all came from different design styles and time periods, it was a true challenge to be able to come up with a visual language that would harness these eclectic set of items unto a unified and cohesive brand umbrella, while at the same time feeling contemporary and representing the client's tastes and personality. We began the branding process with finding a name that would represent the brand's philosophy and explain their particular offering. The brand’s philosophy is not just to restore furniture, but to “heal” them and give them a new life in a different home. The goal is to rehabilitate the piece from its core to continue transcending the passage of time and owners. From these concepts comes the name "Reviver", which means "the one who lives again”. The name is also a palindrome, a word that reads the same forwards and backwards. Conceptually, we wanted to convey a sense of a round trip associated with upcycling and the multiple lives of restored objects: a virtuous circle. We found a palindrome a suitable metaphor for this. We took most of the visual inspiration from the "Eclectic Chic" interior design style, since it's the true example of how to successfully make very different elements seem part of a cohesive whole. This style is also what the staff writes about in their bi-monthly free magazine "The Reviver Gazette". Eclectic Chic doesn't shun away from clashing colours and textures and has been for a significant amount of time the leading style of the century and the synonym of what's considered contemporary. To reinforce the brand's ethos, we developed a custom typography for the logotype, in which each character has a module that repeats itself (representing the multiple lives of the objects). Concurrently, the general aesthetic contrasts images and colours from another era against layouts, effects and contemporary typographies, representing the whole reviving process both in their print collateral and their e-commerce website. The brand’s philosophy is not just to restore furniture, but to “heal” them and give them a new life in a different home. The goal is to rehabilitate the piece from its core to continue transcending the passage of time and owners. From these concepts comes the name "Reviver", which means "the one who lives again”. To reinforce the brand's ethos, we developed a custom typography for the logotype, in which each character has a module that repeats itself (representing the multiple lives of the objects). We took most of the visual inspiration from the "Eclectic Chic" interior design style, since it's the true example of how to successfully make very different elements seem part of a cohesive whole. This style is also what the staff writes about in their bi-monthly free magazine "The Reviver Gazette". The general aesthetic contrasts images and colours from another era against layouts, effects and contemporary typographies, representing the whole reviving process both in their print collateral and their e-commerce website.